How do I modify vanilla drops to the famous 0% nodrop? forums.pvpgn.pro → [EN] Diablo → How do I modify vanilla drops to the famous 0% nodrop? Topic: How do I modify vanilla drops to the famous 0% nodrop? Currently my server is using vanilla drops but I know some other versions use the famous 0% nodrop for all players mode and most popular private servers such as Slash also use this drop version. How do I change vanilla drops to 0% nodrop for all players (1-8) mode? Re: How do I modify vanilla drops to the famous 0% nodrop? This change can be made by modifying the patch_d2.mpq on the D2GS side of things, a lot of changes made within these files sometimes do need to have client side patching (your players will also need the same patch file) but luckily with droprate changes - these can be done all server side without any client side patching. You'll need two programs - MPQ Editor and table editor, also with the MPQ editor you'll need the 1.13C (assuming that is the version you are running) listfile - this means the MPQ editor can understand each file in the patch MPQ. All of this can be downloaded from Phrozen Keep. 11) Enter a game. If no errors - we're good to go! 13) Test the patch file again, if no errors or anything then you can place it on your server! Anyways, that is the basics. I'm sure you can find me on Slash's subreddit or Discord channel if you have further questions. GL! Do you know which tables to change the vanilla XP rate to a bit higher? Also, do you know how to increase party size from 8 to 10+ ? Like annihilus.net/content.php does, they increased to 64 but on my server I'm planning to have 12. Last question, do you know how to add 1.08 rare items to 1.13? d2region has their on 1.09d server. I just wonder if I download their and add to 1.13 would be a lot easier. I love to join your discord server for future help needs too. If ya can post an invitation here and thanks. Yes, I can do a couple of those things. Not sure how they increased party size, that is out of my moddifying knowledge. I followed the guide and tried to modify the MPQ from single player first and nodrop 0% was working fine but after I replaced the server side MPQ from the Single player it wasn't working. Any idea why this could be happening? That is pretty much the same method I was using. Did you restart the server after copying over the new patch file? I only have the treasureclassex.txt in this directory. Do I need to edit both treasureclass and treasureclassex ? Where do I find the treasureclass.txt ? I'm using D2 LOD v1.13c if that makes any difference. I opened the D2_patch.mpq and extracted the treasureclassex.txt. Tested it with the -direct -txt method and it worked great - no drop=0 in game. Edited, replaced, compacted, and closed the D2_patch.mpq. Reopened it to make sure the txt file was edited correctly and then put the new Patch_D2.mpq in my D2 directory and tested it in a single player game. Nothing. Drops are vanilla. I don't get it. Are you compiling the files *.bin also inside the Patch_D2.mpq? Guys, I'm sorry... I figured it out. 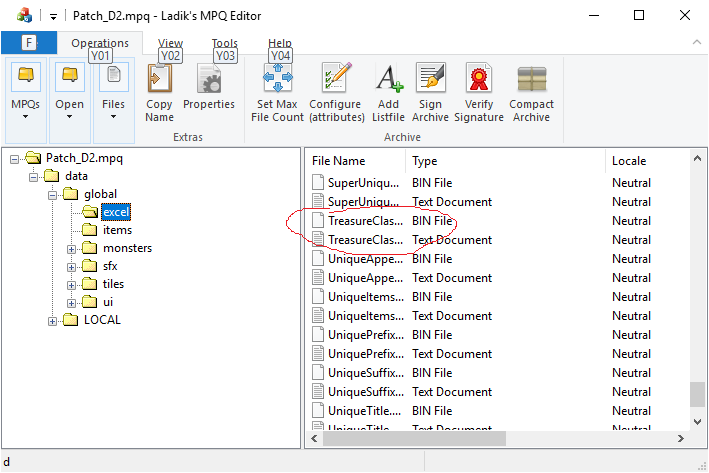 I wasn't creating the "new" bin file before recompiling the MPQ. 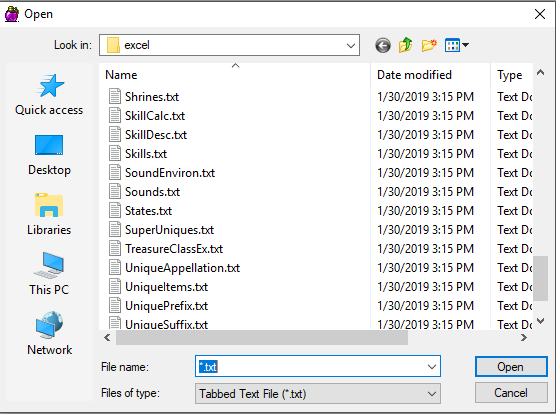 I needed to put the edited txt file into the data\global\excel folder inside my Diablo II directory, add the -direct -txt parameters to my desktop shortcut, and then go into a game to procure a "new" treasureclassex.bin file which can then be found inside the Diablo II\data\global\excel location. This new bin file must replace the original bin file inside the Patch_D2.MPQ along with the edited txt file before recompiling the MPQ and placing it into the Diablo II folder.